UPDATE: Giveaway is now closed. Thanks for participating! As of last week I've won two blogger giveaways: Columbia Lily's silk shantung purse and nowSHELTER Home's Domino book. I'd worked on a couple of giveaway projects to thank you for reading some of those 100 posts but didn't finish them on time. Now, at post #134, it's way past time to say thanks and pass on the juju. This giveaway shirt is the empire waist "after" shirt above. It is made to fit like a glove on someone with 35.5" bust and 36" hips. This seems to translate to a size medium, perhaps on the smaller side of medium. But you can see it's not ultra-fitted, so there's wiggle room if your measurements are different by a little here or a little there. Plus, with the empire waist, this will still look great on you whether you are petite, average, or tall in stature. The fabric is a wrinkle-free cotton/ poly blend (55%/ 45%), in a sunny yellow. I apologize for the paled-out color in the "after" pics -- it's been very cloudy and the "before" picture shows the true color more accurately. Borrowing an idea from Tina at glam.spoon to spread the blog-lovin', here's the low-down on the giveaway: if you would like a chance to win this shirt for yourself or someone you love, visit one or more of the blogs I read in the sidebar, and leave one quick comment with who you visited and what you liked. I'll ship internationally so get your comment on! Every eligible comment left by Sunday, May 3 at midnight CST will be randomized and I'll let you know the winner on Monday. Sound good? On a related note... I had a review meeting a week and some ago with David Walker at 302 designs, and to make a long story short, I rushed to find a model I could photograph in the first 3 shirts. (And this someone needed to be the same size as the form I draped on, and who would photograph well, and who looked like Austin, 'cause this whole 302 designs project is about Austin.) First call was to Meg Kanewske, a friend who was my prenatal yoga instructor and whose daughter is in the kinder class down the hall from Louis. She now owns a studio called Kula Yoga in Austin and still teaches, so here she is, tall and thin and fit and photogenic and she called me back and said she was up for it. Lucky me. She fit the clothes perfectly. How many sentences can I italicize in a row? How great to see how the tops fit and draped on a real body that moves and breathes, and to hear Meg's feedback about how it felt to wear them. I shall keep those photos under wraps for now, but to give Meg a personalized thank-you, I thought I would make her a men's dress shirt refashion. After all, now I know she and Carmen have the same measurements! I'd never draped a men's dress shirt refashion on Carmen, and I remembered one specific comment she made while trying on the 302 refashions: She liked how the yellow & black top gathered at the empire line without making her look pregnant. So instead of using the full width of the original men's dress shirt, I draped and cut it so that the gathering would be more strategic and less... gestational. She wore it today, so I think she likes it! I checked out the last stitch blog. 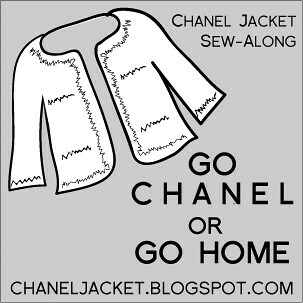 I liked how the blog combined sewing, fashion, and other design elements. If a blog is completely pattern reviews, then I get lost by all the detail, but if it doesn't have anything to do with sewing then it isn't my cup of tea. I coincidentally also checked out the last stitch. It's not a blog I had come across before, but she's got some great tutorials. Your shirt refashions are fabulous, by the way. Ok, I visited "Made" who had the most beautiful photos of her children in the most gorgeous clothes. Sigh. Envy. Lots of envy. I checked out Sidewalk Chalk (mostly b/c I loved the name). Beautiful photography and the most amazing looking food. YUM. Love the chance at such an awesome giveaway. I'm much less of a seamstress, and much more of a knitter, so I loved sixoneseven. Her chevron baby blanket was gorgeous! Antoinette! I nearly forgot that my former fit model is attending school in Austin and I should hook the two of you up. That said, I can't WAIT to see your 302 designs. Amazing giveaway! I would love to skip around in this dress all summer long. It's beautiful. I visited Keiko Lynn's blog and wow, how fun is she? I love the goat in the hat, the swing, and the ruffly blue Betsey Johnson dress paired with bunny ears. Great giveaway! I visited Pansy Lane. I love the great pictures there. Does it count that I already read How About Orange? I checked out several, but just didn't get into them. I won't name them because who cares what my opinion is, so it would just be rude. I always checked out the progress of your pants sew-along buddies though. I feel a little guilty entering this giveaway since I don't have glowing reviews to share with you, but the shirt dress is just too cute! I had a look at a few but I found that the most recent post about the Striped Work Dress, on the Small Object Steno Pad blog was the most useful for me to read since I had just purchased a Japanese pattern book! I visited 'made' and while I loved everything (it is all just too amazing and too beautiful... not to mention the exquisite photos), the dotty top is now on my "To Do' list. It is gorgeous. I really like your shirt refashions, so generous of you to give one away. I checked the GadeMode blog, and Remix. I really like seeing what real people are wearing, even though a lot of the time I don't "get" the aesthetic. It's just good to see people expressing themselves. I like that a lot of stuff on remix is thrifted. I love your refashions! Count me in for the giveaway! I read Small Object Steno pad regularly and really enjoy it. I also checked out sixoneseven - such great pictures on there! Love them! On Eleven Stitches, I really love the Amelia cardigan she made. I'm going to have to add that to my knitting for the fall. I checked out several more of the blogs you read and enjoyed them all. Anything with sewing/food/photography/yarn and I'm almost guaranteed to like it! I love Miami Skirt's ability to make such cute stuff with kids! I can't manage to get things done and I'm childless! Eek! Thanks for the giveaway--super cute! Love the refashioned shirts, and the tutorial is awesome...could you please tell me the ruler' you used to measure the sleeve. I have been wanting to purchase the right ones to adjust sleeves as such, and was not sure of which to get, since i do not sew for professional or selling purposes, a basic one to start would do good. What size is the one you use? Hello, Anonymous -- I can't reach you directly so hopefully you will see this comment. The ruler for armhole adjustment is the irregular french curve #17. I purchased mine at the local drafting supply store for under $4 though I have heard there are some in sewing stores for upward of $20! They also help with sleeves but I use flat patterns for my sleeves.